This past weekend we watched 3 of 4 NFL playoff games. I'm not a sports girl. Normally there is very little sports going on in our household unless the Chicago Bears or Cubs (from Hubby's home town) are in some kind of playoff or final game. Chicago was not in any of the games we watched. But Hubby's Dad was in town and he follows football. I won't lie, I have zero interest in the game of football. What does interest me is an occasion to cook and bake. And football watching is perfect for whipping up some finger foods. Seems like we've been on an appetizer kick lately. Our New Years Eve eve was an appetizer feast. And so was day 1 of football watching. I tried out two new recipes, roasted red pepper crostini and these baked turkey meatballs. Both were a hit with Hubby and his Dad. As I was getting everything together for the game, Hubby came into the kitchen and grabbed a finished meatball hot off the baking sheet. He said, "these are really good!" Score! Hubby is a big fan of turkey as an alternative to beef. It's been a slow conversion for me, but I am finally getting to a place where I don't mind using ground turkey in place of beef. And in many cases I'm really starting to like it. These meatballs fall into that category. They pack a lot of flavor with onions, garlic and Parmesan cheese. I really like using fresh herbs in meatballs because they bring a bright flavor that you don't get with dried herbs. In this recipe I used fresh Italian parsley. Next time I will add basil in too. What I like about this recipe is it's a good base recipe and you can add flavors to suit your tastes. I served them with barbecue sauce, but I think they would also be great with your favorite marinara sauce or even a basil pesto. I also like that these meatballs are baked and not fried, making them a fairly healthy option. The meatballs are easy to put together once you get the chopping out of the way. If you have a small cookie scoop it's a cinch to portion out equal size meatballs. Basting the meatballs with sauce for the final 5 minutes of baking gives them a nice color and a lightly glazed crust. You can serve them straight from the oven with some extra sauce on the side. Or you can throw them in a small crock pot or a medium saucepan with some extra sauce to keep them nice and warm until your party starts. Stick a toothpick in them and these bite size meatballs are ready to go. Our appetizer trend continued on day 2 of the football bonanza. However they came from the restaurant/bar where we set up camp for the last of the 4 games. Apparently none of the teams my father-in-law picked to win, won. Sorry Jerry! At least we were well fed. 1 cup of your favorite barbecue sauce, divided into 1/4 and 3/4 cups. You could also use marinara sauce in place of barbecue sauce. Preheat oven to 350. Line 2 baking sheets with foil and spray with non stick cooking spray. In a large bowl, combine all ingredients except barbecue sauce and gently mix together until fully combined. Using a small cookie scoop or a tablespoon, portion out 1 1/2 inch size meatballs and gently roll them between your hands to round them out. Place on baking sheets about 1 inch apart. Bake for 8 minutes and turn meatballs using a metal spatula. Return to the oven and cook for an additional 6 minutes. 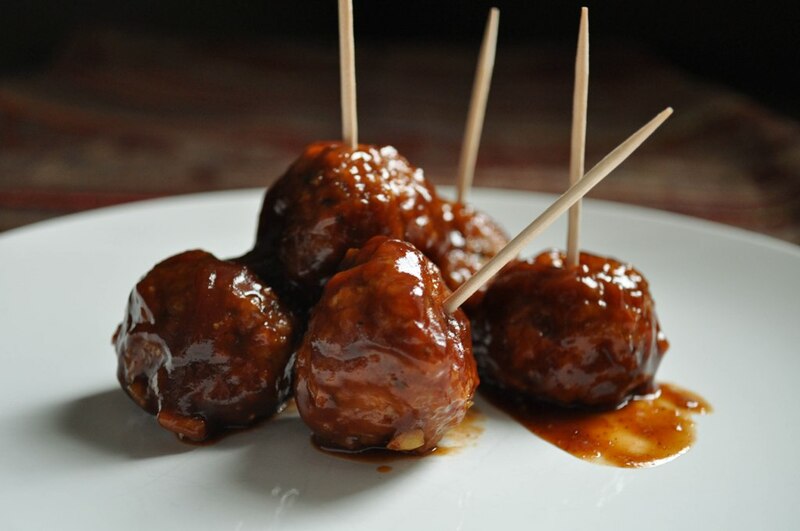 Remove sheets from oven and lightly brush each meat ball with 1/4 cup of the barbecue sauce. Return to oven and cook for an additional 5 minutes. Warm the remaining 3/4 cup of barbecue sauce in small saucepan or in a small bowl in the microwave. Serve immediately. Or you can add the sauce along with 1/4 cup water to a small crock pot and add the meatballs to keep warm for a party. For other healthy Super Bowl snacks check out the round up on Eat Yourself Skinny. A great meatball appetizer is a great thing. And yours looks so good. Can you email me a couple of those? Great appetizer recipe that is not only delicious, but easy and so quick to put together.